Music, tech, film, and barbecue are among the reasons that fans descend on Austin, Texas, for the annual South by Southwest (SXSW) festival, pouring more than $300 million into the city's economy -- and there's an opportunity for brands to let them take the music and content home. But marketers need to rethink their audience and realize it no longer consists strictly of millenniums. As the amount of time spent searching and watching SWSX-related videos per view rose 21% since January 2013 on YouTube, so did the age of the SXSW viewer. This finding suggests the age of those who attend the event also continues to rise. While 18- to 35-year-olds account for 75% of the time spent watching the event-related videos, last year the 35- to-55=year-old age group more than doubled its time spent watching SXSW videos on YouTube, per stats released by Google Friday. Video sites help brands live the moment longer, creating opportunities to reach SXSW fans beyond Austin's city limits as mobile continues to drive U.S. video views. SXSW-related content on YouTube grew 62% in 2014, per Google. 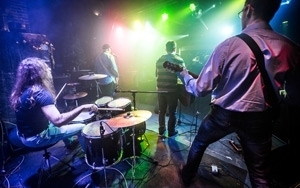 Overall, an estimated 55,000 visitors checked out music showcases at SXSW in 2014, 72,035 attended film screenings, and 45,500 visited the gaming expo and arcade. With so many influencers, early adopters, and fans on site, the growing cultural impact of SXSW has made it a mainstay for brands keen to reach these audiences. Compared with viewership immediately after SXSW in 2013, the amount of time spent on mobile watching video content from the festival rose 137% in March 2014, compared with 79% on desktop, per Google, which will host a SXSW Music house Wednesday through Friday. Months after the festival has ended, people seek SXSW-related content and videos. In 2014, viewership outside of the festival showed a 69% year-over-year increase in the time spent watching on mobile devices and 41% on desktop.